VATICAN CITY Pope Benedict XVI gave his pontificate's final Sunday blessing from his studio window to the cheers of tens of thousands of people packing St. Peter's Square, but sought to reassure the faithful that he wasn't abandoning the church by retiring to spend his final years in prayer. The 85-year-old Benedict is stepping down on Thursday evening, the first pope to do so in 600 years, after saying he no longer has the mental or physical strength to lead the world's 1.2 billion Catholics. But while he has lately looked tired and frail, the crowd filling the cobblestone square seemed to energize him, and he spoke in a clear, strong voice, repeatedly thanking the faithful for their closeness and affection as they interrupted him, again and again, with applause and cheers. Police estimated some 100,000 people turned out. 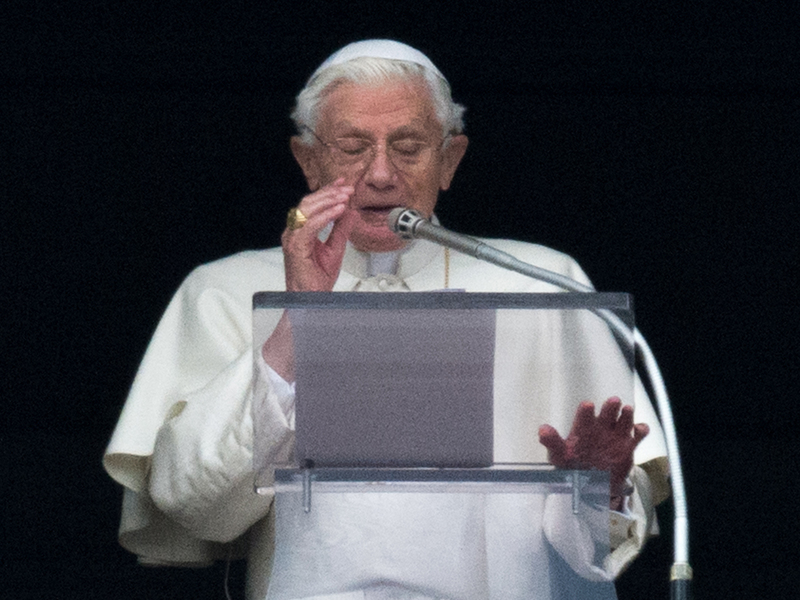 Benedict told the crowd that God is calling him to dedicate himself "even more to prayer and meditation," which he will do in a secluded monastery being renovated for him on the grounds behind Vatican City's ancient walls. "But this doesn't mean abandoning the church," he said, as many in the crowd looked sad at his departure from regular view. `'On the contrary, if God asks me, this is because I can continue to serve it (the church) with the same dedication and the same love which I have tried to do so until now, but in a way more suitable to my age and to my strength." The phrase "tried to" was the pope's adlibbed addition to his prepared text. Benedict has one more public appearance, a Wednesday general audience in St. Peter's Square. Benedict smiled at the crowd after an aide parted the white curtain at his window, telling the people, "thank you for your affection." Heavy rain had been forecast for Rome, and some drizzle dampened the square earlier in the morning. But when Benedict appeared, to the peal of church bells as the clock struck noon, blue sky crept through the clouds. "We thank God for the sun he has given us," the pope said, sounding cheerful. As cheers continued in the crowd, the pontiff simply turned away from the window and stepped back down into apartment, which he will leave on Thursday, taking a helicopter to the Vatican summer residence in the hills outside Rome while he waits for the monastery to be ready. A child in the crowd held up a sign on a yellow placard, written in Italian, "You are not alone, I'm with you." Other admirers held homemade signs, saying "Grazie." No date has yet been set for the start of the conclave of cardinals, who will vote in secret to elect Benedict's successor. One Italian in the crowd seemed to be doing a little campaigning, hoisting a sign which mentioned the name of two Italian cardinals considered by observers to be potential contenders in the selection of the next pontiff. Flags in the crowd represented many nations, with a large number from Brazil. The cardinals in the conclave will have to decide whether it's time to look outside of Europe for a pope. On Saturday, the Vatican lashed out at the media for what it said has been a run of defamatory and false reports before the conclave to elect Pope Benedict XVI's successor, saying they were an attempt to influence the election. Italian newspapers have been rife with unsourced reports in recent days about the contents of a secret dossier prepared for the pope by three cardinals who investigated the origins of the 2012 scandal over leaked Vatican documents. The reports have suggested the revelations in the dossier, given to Benedict in December, were a factor in his decision to resign. The pope himself has said merely that he doesn't have the "strength of mind and body" to carry on. CBS News correspondent Allen Pizzey reports from Rome that lurid reports in the Italian press have spoken of a gay lobby of homosexual priests whose activities have not only gone against church teaching but have left them, and by extension the Vatican, open to blackmail. The three cardinals who investigated the leaked documents are expected to meet with Benedict Monday, a sign of just how seriously he takes the issue, Pizzey reports. What's not clear is whether the dossier will be given to the rest of the cardinals before they enter the conclave or left in a safe for the next pope's consideration.